The Iranians are taking your oil, with BP and SHELL. You are a colony of a colony Iran. This needs to go public. The weakness of your proposal is that it rules out incomers who see themselves as ‘scots’, e.g. by naturalisation. But then there would need to be some way to officially recognise Scottish nationality as apart from (or even as a part of ??) British nationality, at least up until independence. Given the level of fudge over nationality that currently exists in the North of Ireland, would that really be too difficult? My proposal is to include only individuals born and residing in Scotland. This ensures only persons with a Scottish heritage are able to decide the future status of the country. Incomers who would vote “Yes” are vastly outnumbered by those who would vote “No”. In the 2014 referendum 52%+ Scots voted for independence. The resultant final figure of 55% “No” was warped by the votes of persons from outwith Scotland gaining a vote due to residential qualification. Many left Scotland returning to England and northern Ireland soon after. I see your point, but fear that it could easily be characterised as just another (non too subtle?) way of fiddling the figures. Firstly, we’re rather young at birth and have no control whatever over the circumstances. Anymore than e.g. the colour of our skin etc. Secondly, the principle I’m familiar with is that by and large decisions should be made by those who will be effected by them. So for example someone born in Scotland but raised elsewhere in the UK, and who just happened to be resident north of the Border when the referendum was called, even though they had no permanent attachment to Scotland (e.g. they might just be working or studying there for a year or two) would get a vote by your rules, even though they would barely be effected by the outcome. I would like to see an Indy Scotland, indeed it’s long overdue, but I don’t see how fiddling the franchise could do anything but harm. If it were proven statistically that e.g. 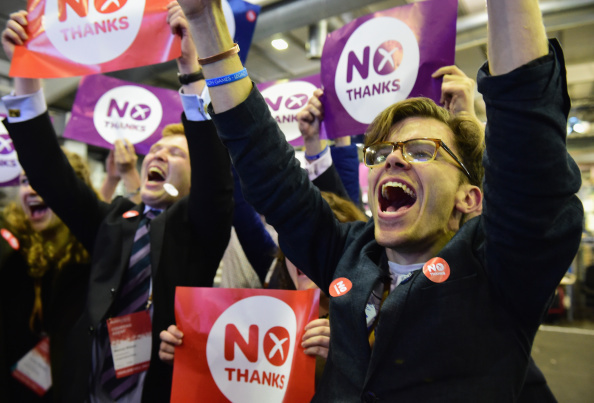 left-handers were more likely to vote against Scotland, would you seek to disqualify them too? wow! thanks a bunch! As someone who was born in France and voted yes in the referendum, married to an English man who also voted yes, thanks for your blinkered attitude regarding who belongs, who has rights and who does not. Thanks for your total disregard for those who genuinely care for Scotland. I cant tell you how many so called real Scots I convinced to vote yes in the referendum who wanted to vote no….How far do you intend to go back in time to prove Scottish roots? Being French, you can bet that I have roots that go back to the Auld Alliance. …What you propose is simply that those you consider “other” should not have a voice. In doing so, you reveal your own prejudice and your xenophobia…I had met this kind of prejudice when I was living in England, but not once since deciding to live in Scotland. So thank you for this new experience and for opening my eyes. I now know my place. Cathie, You are so wrong. Of course you would have a voice in an independent Scotland. But non-Scot “yes” voters are vastly outnumbered by those who would vote “No”. A fact evidenced by the result of the 2014 referendum. I contend that a voting base as I envisaged would provide the best chance of a positive result next time. To conduct a referendum with the same criteria as before would be foolish to the extreme. Persons such as yourself, who support an independent Scotland should be happy to stand down from the process if it assists the aspirations of all who wish to live in a Scotland free of the unfair external political pressures of Westminster. I feel your views are completely contrary to those of the SNP who continuously say how inclusive they are and how they welcome immigration so to preclude them from voting would certainly be anti everything the SNP say. The SNP’s inclusivity agenda brought about the 2014 defeat. The Scottish independence movement needs to learn lessons and adjust priorities to ensure a win next time. The revelation in the Edinburgh University report on the referendum that Scots born voters decided 52.7% in favour of independence was thwarted by voters from outwith Scotland. Calton jock :don’t worry, Westminster is ensuring that EU citizens will not be allowed to vote in any referendum… Like we were not allowed to vote in the brexit referendum. Why do you think that is? Honestly wondering whether you really have the good of Scotland at heart. Cathie, I can assure you I do have the best interests of Scotland at heart. Our chances of succeeding are greatly improved if you and others like you are denied a vote, just the one time. Thereafter all who choose to reside in an independent Scotland who are not Scots by birth will be able to apply for citizenship fully regularizing their status. When Westminster sends the tanks to Scotland, would you like eu citizens living in Scotland to stand down too? Basically what you want is for only those who are Scottish by birth and voting yes to be allowed to vote. This is, quite frankly a ridiculous concept! There are always rules about nationality everywhere in the world and although there is as yet no Scottish passport and no Scottish citizenship law we could apply acceptable existing law from elsewhere to determine a nationality for people.What better than to use existing UK law . To get a UK passport you either have to reside in uk and have been born here or reside in uk and have a parent who was born here. Residing in a country should not and does not anywhere in the world on its own give you the right to have a passport or get citizenship or have all the voting rights, there are of course different rules in existence for different kinds of voting depending on whether it’s a local election a general election etc etc. In some countries you can have voting rights if you have lived there for a set minimum number of years but that is not the case in all countries. I have lived in many countries around the world, I still care for those countries but I did not at any time believe that I should have a right to determine those countries long term future and rightly so I don’t live in them any longer and that was the problem with the Scottish independence referendum you only had to be living in Scotland on the FDA’s of the referendum to qualify for a vote, many many of those who voted have left Scotland never to return, the chances of never to return is increased for those who were not born here or who’s parents were not born here, most people living in a particular country are doing so because they were born there or their parents were born their they have family history there. This crazy idea that just because Scotland happens to be where you are living at this moment in time gives you the right to vote on its long term future is plain silly and unprecedented. There may be exceptions but there are exceptions in all considerations of nationality and voting rights ,the exceptions are minute and acceptable in the quest for fairness for the huge majority. I agree entirely with what you say but would still apply the need to be a Scottish income tax payer. No other country in Europe applies the ‘inclusivity’ principle as in Indy14. The SNP committed independence suicide by uniquely and exclusively applying inclusivity to a constitutional vote. What’s the problem with the SNP using the European standard? I agree entirely. It may be English born people who qualify through residential qualification would honour the privilege extended to them by a quirk of fate and abstain from voting, if they are unable to vote Yes.